In news almost as big as the fact that Fernando Alonso has a kitten, Formula One officials announced their goals for the series’ revamped engine regulations for the 2021 season. Some of the biggest planned overhauls will be what fans have called for for years: louder engines and lower development costs. You might be wondering why we’re talking about 2021 right now. F1, like a weird, dystopian government, overhauls and issues new rules of engagement every few years. That’s why you’re reading about 2021 in 2017, more than three years before any of this stuff will actually take effect on the race track. F1 plans for the 1.6-liter V6 turbo hybrid engine introduced in 2014 to stick around, but wants to give fans the thing the sport robbed from us with these “green” engine alternatives: the noise. 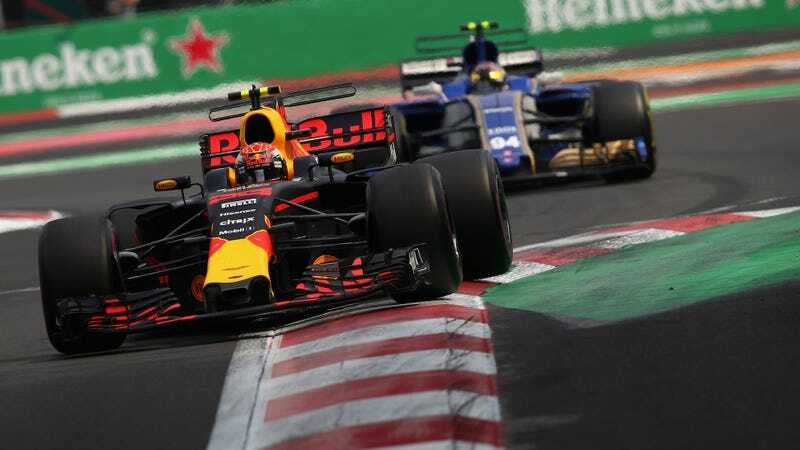 The years of F1 cars getting quieter and quieter may finally be over, since officials want to improve the sound of the engines with higher RPMs. F1 said earlier this year that it would finally give fans the engine noise they demanded with the new engine rules, and thankfully, it looks like the series will actually do it. Another thing the series said it would change for 2021 earlier this year was the cost of developing an F1 car, which is, of course, astronomically high. Officials plan to do so by limiting teams’ design freedoms, which could level out the field a bit more and keep one team from running away with the wins every year. Other proposals F1 gave manufacturers on Tuesday included the elimination of MGUH, which is a system that Motorsport.com reports is kind of unique to F1. It spins the turbocharger at lower revs, and works like the MGUK system that F1 will keep around—both systems can recover and supply energy. But to be honest, you probably stopped reading this at “louder engines” in the headline. Go ahead, celebrate, and if you made it this far down the blog without calling everybody up for a LOUD ENGINE PARTY, thank you for your dedication.